As if there wasn’t enough incentive to cross into the U.S. illegally, let’s tell ’em where all the “free” guns are. 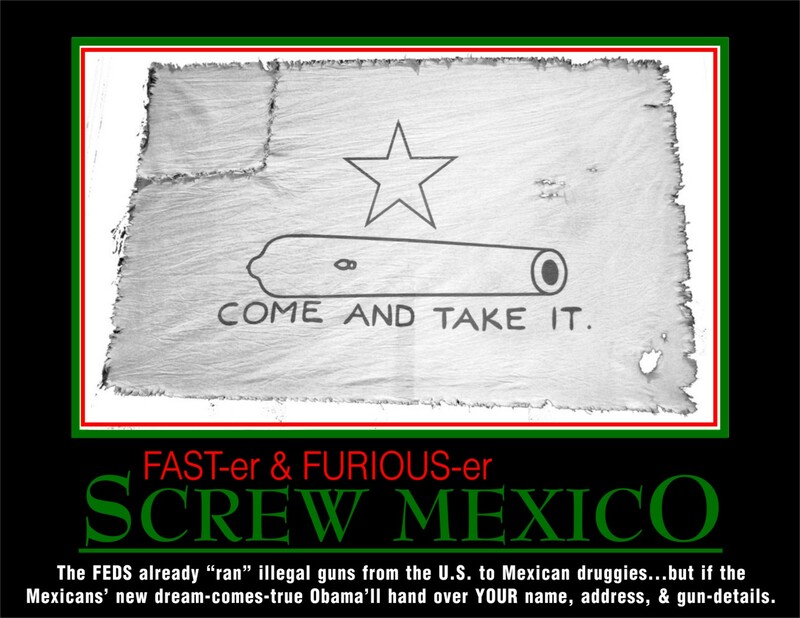 AG Eric the Holder and his peeps will never be indicted on these [“Fast and Furious”] gun-running crimes which resulted in 1000’s of dead Mexicans and a few dead Americans (surprise) nor will any Feds who would entertain the traitorous thoughts of such information-sharing with a foreign government get what they deserve. Mexico’s Congress voted to formally ask the United States Senate to create a registry of all commercialized firearms in the states of California, Arizona, New Mexico, and Texas. Although the motion will have little impact in the US, it shows the gun control issue continues to resonate on both sides of the border….